Six weeks ago several hundred knitters cast on for the Costa Maya KAL. Since we started, our ranks have grown to over 600 knitters! Now that we are less then a month away from the final prizes, I thought it would be fun to step back and see a tiny corner of how a design comes to life. So, the Costa Maya KAL is in full swing, and I’ve gotta be honest… you guys are KILLING it!! I’m always so excited to pop on Ravelry and see how everyone’s projects are coming along. No pressure, but please update often, with this bum arm I’m living through vicarious knitting pleasure!! 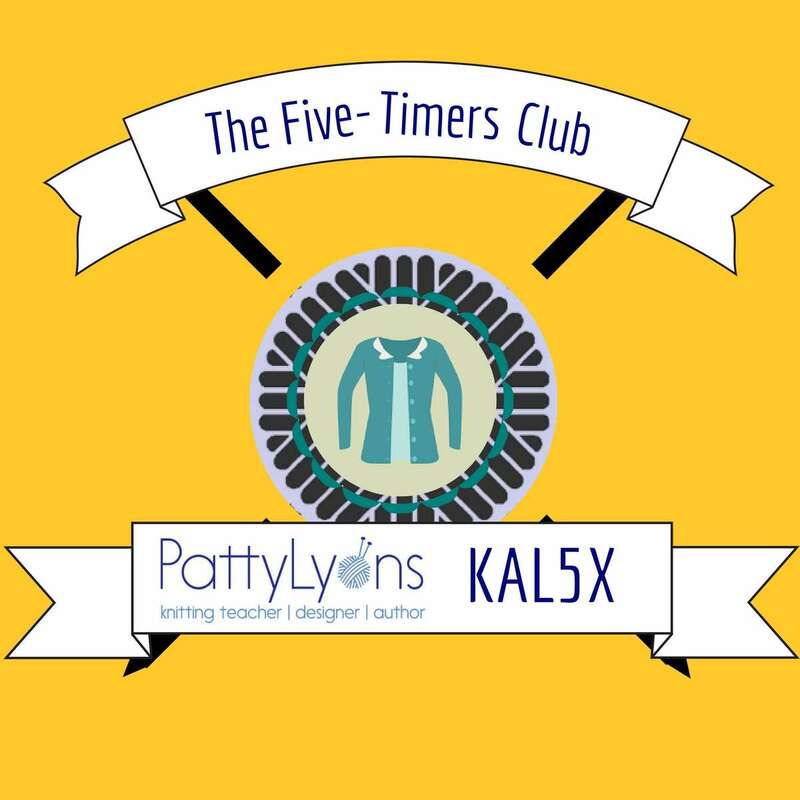 Welcome to the Five-Timers Club!! Student Projects – The Best Part of My Job! EDIT – The 2018 KAL is Harbor Springs. On sale in July, casts on in Sept. In two weeks my newest Video KAL, Costa Maya will kick off and I’ll get to see all your work. I love seeing your progress with pictures online, but nothing beats meeting you all in person and seeing your projects. So today, an ode to all the amazing knitters who have been kind enough to share your talents with me. I can’t WAIT to see what you come up with next! Welcome to Costa Maya Knit-Along (KAL)! It’s time for the Spring Knit-Along!!! I am so excited to start another KAL on my Ravelry group. You asked for it, so you got it . . . A CARDIGAN!!! There will be tons of teaching and fun, prizes and a great garment! During the KAL period you get the full sweater class for just $1 over the price of the pattern!!! There will be HOURS of video tutorials, and modification documents to help you every step of the way. Use Promo code: CostaKAL During the pre-sale period before Feb 26 and get 10% off! After May 8 the pattern alone will be $8, the KAL – sweater class versions (with all the how tos, video tutorials, and modification notes) will be $14. It was a busy fall / holiday season . . . not all finished, but hundreds of knitters picked up their pointy sticks a few months ago to begin another KAL / Sweater class, Rising Spades. In November we got to see what the knitters were up to. The KAL winners have been chosen and awarded! If you are feeling inspired, Rising Spades KAL Sweater class + pattern comes with over 2 1/2 hours of video tutorials, all the sweater modifications and knitting how tos for only will be $14.00!! Through it all, the help and support of every knitter on the Ravelry group was always there. Over 2100 amazing knitters let every first time sweater knitter know . . . they were not alone! Rising Spades KAL PRIZES: You Could Win! The deadline to get your Rising Spades projects finished (or started! )—for a chance to win prizes—has been extended to DECEMBER 23rd!!! There will be 3 grand prize winners. Last week clue #1 for the Rising Spades KAL / Sweater class hit the in box of 200 knitters. We’ve only just begun and there are new knitters joining us everyday! Knitters who join us before Dec 11 will still get 19 video tutorials (nearly 3 hours of filmed sweater instruction), all the sweater modifications and knitting how tos for just the price of the Rising Spades pattern – $8.00!! Let’s see how everyone’s doing. For a while now I’ve been writing a column called Patty’s Purls of Wisdom. It has had a life in several magazines and I’m thrilled that recently it joined Twist Collective. Knitter’s send in their questions, ala Dear Abbey, and I answer them. It’s full of all kinds of knitting advice, and this knitter asked a brilliant question that is has baffled many a knitter.